PIGMY OWL ON DEAD SPRUCE. Slovakia, 2008. In my recent trip to Slovakia, I had the plan to photograph two species I considered absolutely necessary to have in my next book on the valley of Tichà. 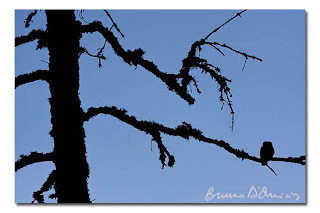 Two quite elusive birds, these, which beat the time for spring to take place over winter in the mountain ecosystems. The first, the capercaillie, plays its rytmical courtship song in the deep of the pristine forest during the dusky hours at the end of the night. The second, the black grouse, being a loud and social performer in the leks on meadows -still covered by snow, of the mountain slopes and summits. Having been for a long time object of an heavy and continuous hunting pressure and showing a large decrease in their numbers due to habitat loss, these two subjects require some remarkable effort to be approached and even more if to be photographed. Therefore, I thought three full weeks of work in the field after months of research, planning and preparation would have been enough to get some decent shots of these shy creatures. Well, I couldn't be more far from reality. So, after twenty days spent in the mountains, I still don't have any good image of these species and will probably have to go back there next year. But why am I writing about this? Because in these three weeks I've learned one of the hardest lessons in my life as a nature photographer. It is incredibly difficult and frustrating to accept a complete defeat when we think our work is flawless. It takes our attention away from all the beautiful things which are still around us. It spoils the experience itself of being out in the wild, which is still the most important thing. It took me a lot of effort to take over those bad feelings and still enjoy what I was doing. It has been difficult. But it seems I've finally managed to do it, looking beyond the apparent lack of success and being eventually rewarded by great emotions and sights - above all, a very pleasant encounter with a relaxed and obliging pigmy owl. Now, what I can advice to all my photographer friends is to never let unfortunate circumstances bring us down too much when we are pursuing wild things. Planning and experience play surely an important role in being successful, especially if blessed by an hint of luck...But failure can just be round the corner, together with a truly bitter professional frustration. Only by keeping our eyes (and heart) well open, then, we will still be able to see the beauty always around us. And isn't this the ultimate meaning of nature photography, after all? Doesn't it lie in its complete unpredictability, which sometimes can still reward us with unexpected generosity? So, never look too long down if things don't go as you've expected, there may always be a little fellow observing you from the top of a nearby tree! 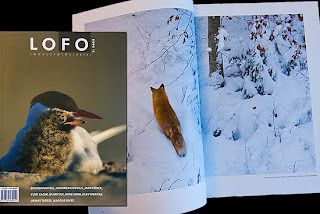 Some months ago, the friend and great photographer Sven Zacek from Estonia kindly asked me to publish a small portfolio of my images on the nature photography magazine LOFO. As I put for the first time my hands on some copies of it, I have been blown away by the great quality of the magazine -great photography shown with a very nice layout on beautiful matt paper, and delighted to see all my images published as huge double-spreads. I can only recommend you to get one or more copies of it! If you want to know more about it or purchase LOFO, click here. me porti un Lofo quando rientri???? ma non ti fai sentire mai!!! motociclisti enduro che inzozzano e fanno rumore pe i boschi!! !